I’ve been preparing for a weeklong survey course on South American cooking at John C. Campbell Folk School for months by researching new ingredients, learning about historical and cultural influences on the food, and testing recipes from arepas to anticuchos. I’ve cut up beef heart in my kitchen, roasted plantain leaves over my gas burner, and eaten my share of yuca. It’s been a delicious and interesting couple of months. A couple of weeks ago, as I was finishing up testing, I asked my husband for a list of his favorite dishes. He loved the Brazilian feijoada (although admitted to still being a bit wary of the salted pigs feet) and said he could eat a chivito (a hearty sandwich from Uruguay) at least once a week. 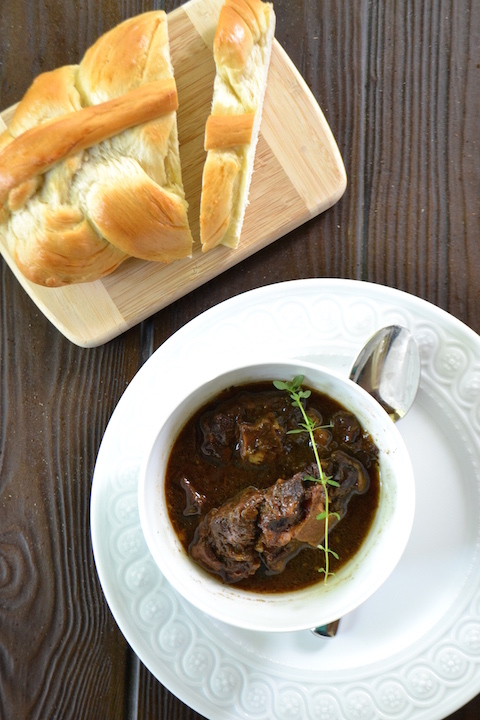 His favorite dish however was one of the last recipes I tested from the tiny country of Guyana: pepperpot soup. Pepperpot soup intrigued me for its use of an ingredient known as casareep. This thick syrup, similar in appearance to molasses, is popular in West Indian cookery and from all that I’ve read, beloved in Guyana. Made from fermented cassava, it’s sticky with a bitter-sweet taste redolent with spices. While it’s worth trying just for the taste, its qualities as a preservative are what really made me curious. 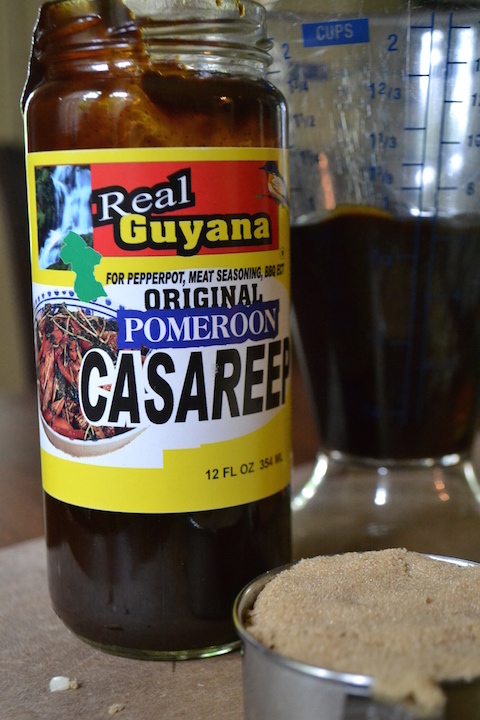 According to the Guyanese, casareep keeps this stew from needing refrigeration; a good quality to have in Guyana where refrigeration is limited. While I took advantage of my fridge and recommend you do the same, locals will tell you that the stew can remain at room temperature for days and just needs to be brought to a boil before serving. Interesting, right? For Charlotte folk, you can find casareep at the Island Grocery on Albemarle Rd. If you aren’t from around these fine parts, you will want to find a West Indian grocery store in your city. Casareep can also be purchased on Amazon, but prepare for a mark-up. It was four times the cost of what I found at my local West Indian market. The stew itself is fairly straightforward which leaves plenty of time to make the plait bread which is not to be missed. 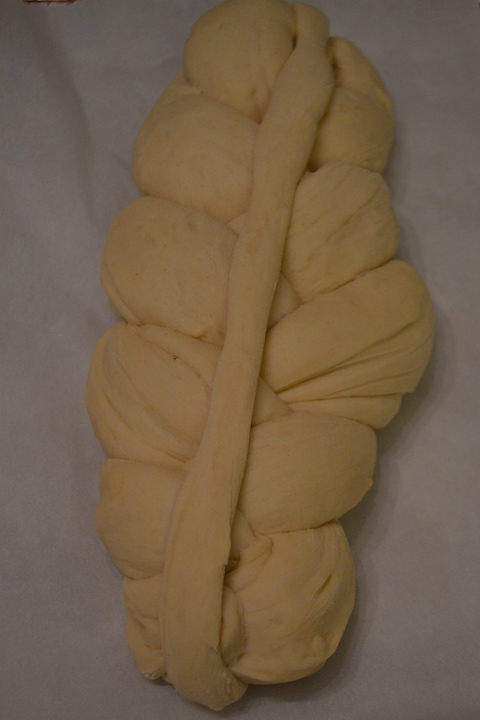 The braided loaf looks like challah, but without egg the final product is very different. Soft and slightly sweet it’s just what you want to mop up any lingering broth and it is delicious as toast the next day. 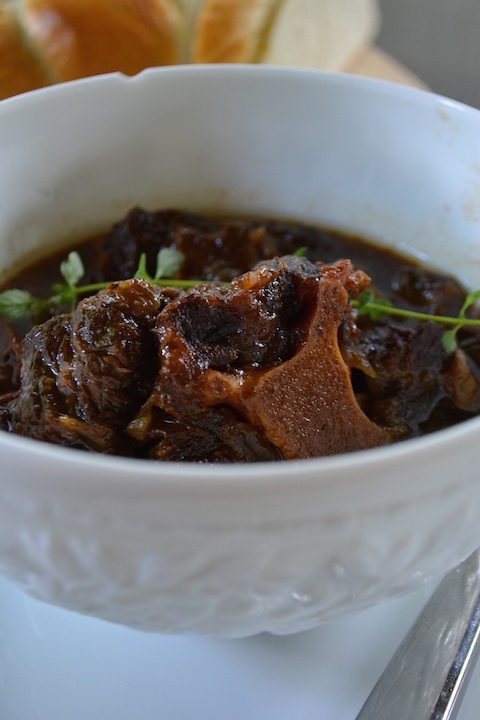 In Guyana, pepperpot is traditionally served at Christmas, but I agree with my husband that I’d like to have this on my table year-round. We like spicy in our household so I used three habanero peppers, but use more or less according to your taste. And, if you really want your stew to be authentic, seek out wiri wiri peppers. I was unable to find them in Charlotte, but if you stumble upon them please let me know. In the meantime, I’m going to look into adding them to next year’s garden. Happy cooking! Heat a large pot over medium-high heat. Add the canola oil (there should be enough to just cover the bottom of the pot) and working in batches, brown the meat. Once all the meat has been browned, return it to the pot and add all the ingredients except the water. Stir to combine then add the water and bring to a boil. Reduce the heat to a simmer and simmer for 3 hours, skimming the surface as needed to remove fat. Season to taste and serve immediately or refrigerate for a day or two as the flavors only get better upon standing. In the bowl of an electric mixer fitted with a bread hook, combine the flour, sugar, and salt and stir to combine. Add the water-yeast mixture and the melted butter and beat, at medium high speed, for about 5 minutes or until dough is smooth and not too sticky. Knead it briefly on the countertop and then return it to the bowl and cover with a towel. Place in a warm, draft-free place and let rise until double in size, about 1 hour. Line a baking sheet with parchment paper. Punch down the dough and remove it from the bowl. Cut off a small chunk from one end. Dust your work surface with flour. 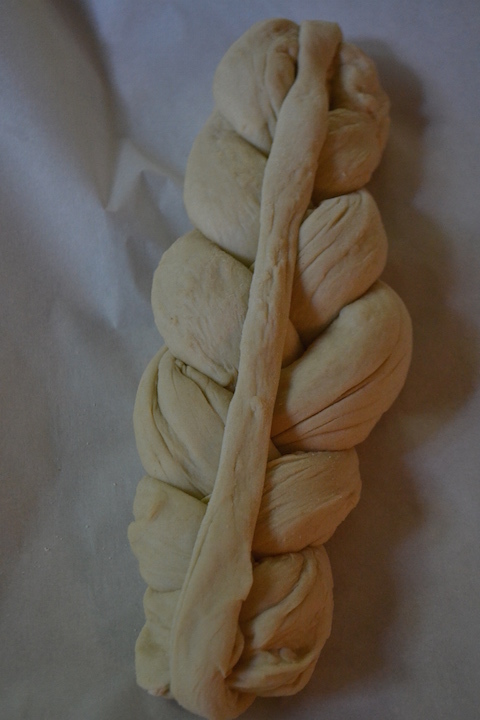 Roll the dough into a long thin strip, about 12-inches long. Set aside. Divide the remaining dough into 3 equal pieces. Roll each one until it is about 14-inches long. Place the three large logs on the prepared baking sheet and squeeze the ends together on one end to hold them together. Braid the dough. Place the long thin strip of dough down the middle of the loaf. Cover with a towel and let rise in a warm, draft-free place for another hour. Preheat the oven to 350 degrees. Add a little water to the egg and beat. Brush the bread with the egg wash. Bake for 25 minutes until golden brown. Remove from the oven and let cool for at least 15 minutes before slicing. My husband is from Guyana and my mother-in-law made this all the time. 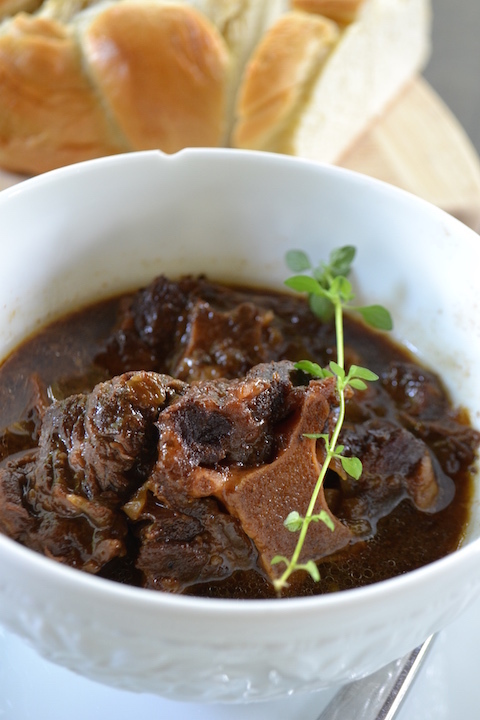 It’s true, you do not need to refrigerate Pepperpot. Just cover it overnight and when ready to eat the next day just boil it and use a fresh spoon each time. We eat it with fresh made Roti, Delicious! Sandra, thanks for confirming that Pepperpot does not need to be refrigerated. Pairing it with fresh made roti sounds like a wonderful idea. Thanks for reading. Perfect! Just like Grandma used to make! I introduced my family to this and they were asking for more! I am making this for the 2nd time in a week! We eat ours with bread and butter. I have never had the plait bread but we always did french bread.